When you pay a visit to Delhi, all that you see is the rushing crowd running towards achieving something or the other. And that’s the usual scene of Delhi but when the Metropolitan City comes to a halt, it makes way for the same people to its rejuvenating parks and gardens. 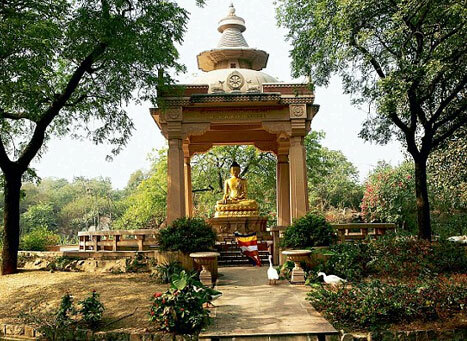 One such park in Delhi which is popularly known for spreading peace in the form of Buddhism is the Buddha Jayanti Park. This park was founded on the 2500th anniversary of Lord Buddha’s enlightenment and has been pulling crowd close to it who have an interest in knowing more about Buddhism through the classes that are imparted about religion here. Moreover, what increases the importance of this park is the sapling of Bodhi Tree which has a belief attached to it that Lord Buddha used to meditate and also attained enlightenment under the same tree which was later brought down from Sri Lanka. The sapling was planted in Sri Lanka by the famous Emperor Ashoka’s son. Another tourist attraction of Buddha Jayanti Park is the shining gold figure of Lord Buddha which is seated on an island like platform in the center of the artificial lake. On a sunny day, the Jamun and Keekar trees provide travellers with a shed and also fill the air with their sweet aroma. Buddha Jayanti Park is well dotted with a number of trees like Gulmohar, Kareel, Babool, Amaltas and more. These trees are the resting place of birds like Peacocks, Herons, Woodpeckers, and Barbets who beautify the sky with their vibrant colours. Some of the major festivals that are celebrated here are Buddha Jayanti and Buddha Purnima to learn new things about one of the most peaceful religions of the World. The park is the right place to spend an evening under the shadows of beautifully branching trees just to relax and unwind. Buddha Jayanti Park is open from 5:00 AM to 7:00 PM. The nearest metro station to Buddha Jayanti Park is Jhandewalan which is located some 3.6km away. The metro station falls on the Blue Line of Delhi Metro.